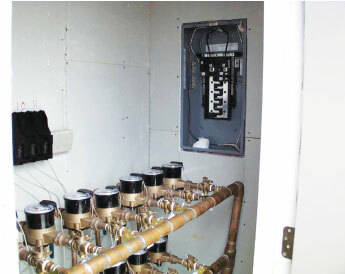 Electrical systems are typically given a great deal of consideration during the design and installation phase of new construction or major renovation, but very little thought after completion — until something fails. Even though our electrical systems are usually very reliable, it is likely that some components will need maintenance or testing at some point in the life of the building or structure. Therefore, the NEC contains requirements meant to allow for safe and practical access to electrical equipment after the time of installation. In the NEC, working space requirements are found primarily in Article 110. NEC 110.26 applies to electrical equipment operating at 600 volts or less. The primary requirement is that both access and working space must be provided and maintained for all electrical equipment. (Photo 1). This is to allow for ready and safe operation and maintenance of the equipment. The definition of equipment in the NECis “a general term, including fittings, devices, appliances, luminaires, apparatus, machinery, and the like used as a part of, or in connection with, an electrical installation.” This is a very broad definition, and when put in the context of working space requirements, likely includes many items not usually thought of when applying the requirements of 110.26. Depth of working space is covered in 110.26(A)(1) and the associated table. The question is often asked, “Where do we start the measurement — from the live parts, the dead front, or the cover?” The NEC tells us that the measurement must begin from the exposed live parts, unless the live parts are enclosed. If they are enclosed, the measurement begins from the enclosure or opening. Table 110.26(A) has three conditions for determining the minimum clear distance. (Figure 1). Condition 1 applies either when there are exposed live parts on one side of the working space and no live or grounded parts on the other side of the working space, or when there are exposed live parts on both sides of the working space that are effectively guarded by insulating materials. For Condition 1 installations with voltages to ground up to 600 volts, the minimum clear distance is 3 feet. Condition 2 applies when there are exposed live parts on one side of the working space and grounded parts on the other side of the working space. The code explicitly states that concrete, brick or tile walls shall be considered as grounded. For Condition 2 installations with voltages between 0 and 150 volts, the minimum clear distance is 3 feet. For voltages between 151 and 600 volts, the minimum clear distance is 3.5 feet. Condition 3 applies when there are exposed live parts on both sides of the working space. For this condition and voltages between 0 and 150 volts, the minimum clear distance is again 3 feet; while for voltages between 151 and 600 volts, the required distance is 4 feet. Certain installations are allowed exceptions from the minimum depth requirements. For assemblies such as dead-front switchboards and motor control centers where all the connections and renewable or adjustable parts are accessible from locations other than the back or sides, there is no working space required for the back or sides of the equipment. If there are nonelectrical parts of such equipment that require rear access to work on them, a minimum horizontal working space of 30 inches is required. Certain low voltage installations also have less required working space. If all the exposed live parts operate at not greater than 30 volts RMS, 42 volts peak, or 60 volts dc, then the inspector is allowed to grant special permission for a reduced working space. The definition of special permission in the NEC is “the written consent of the authority having jurisdiction,” so be sure to get it in writing! The specific amount of working space for these installations is not indicated, so it is up to the installer and the AHJ to work together to determine the safe amount of working space. The NEC provides an allowance for existing buildings, as well. Where there are dead-front switchboards, panelboards, or motor control centers across an aisle from each other that are being replaced in an existing building, the Condition 2 distances are allowed instead of Condition 3. This only applies if there is maintenance and supervision of the building to ensure that written procedures have been adopted to: 1) prohibit equipment on both sides of the aisle from being open at the same time and 2) ensure that only authorized qualified persons are allowed to service the installation. Width of working space is simpler to determine than depth; it is required to be the width of the equipment or 30 inches, whichever is greater. So if you have three 20 inch wide panelboards mounted on the same wall next to each other, what is the required working space? Since there is no prohibition against equipment sharing the width of working space, it could technically be as little as 60 inches. However, this is neither practical (for mounting reasons) nor prudent. It is a better practice to provide spacing between equipment and not to place a piece of equipment right up against a perpendicular wall, since this might make it more difficult to service in the future. Remember that the requirements in the NEC are minimums; you are always allowed to make an installation safer and better. Note that the working space must also allow at least a 90 degree opening of equipment doors or hinged panels, so that might come into consideration depending on the design of the equipment. Height of working space is measured from the grade, floor, or platform, and is required to be at least 6.5 feet or the height of the equipment, whichever is greater. If there is electrical equipment that is associated with the electrical system located above or below a piece of equipment, it is allowed to extend no more than 6 inches into the required working space. There are two exceptions to the base requirement for height of working space. The first is for existing dwelling units, where panelboards, or service equipment, that do not exceed 200 amperes are allowed in working space that is less than 6.5 feet. (Quick fact: individual meter socket enclosures are not considered service equipment per 230.66.) The second exception is new to the 2011 NEC and states that meters that are installed in meter sockets shall be permitted to extend beyond the other equipment, but the meter socket is still required to follow the rules of this section. (Figure 2). 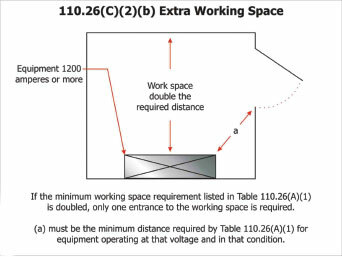 Moving on from the working space requirements, our next requirement is in 110.26(B) for clear spaces about electrical equipment. The required working space is not to be used for storage. No mops, no boxes, no stock, etc. As shown in photo 2, this is a commonly violated code rule. Additionally, if equipment is located in a passageway or general open space, it must be suitably guarded if any normally enclosed live parts are exposed for inspection or servicing. The next few requirements cover entrance to and egress from the required working space. The minimum requirement is that at least one entrance of sufficient area must be provided. This is both to allow access to the equipment and egress from the working space about electrical equipment. Although “sufficient” is considered to be a “possibly vague or unenforceable” word in the NEC Style Manual, it is hard to think of a better word that would be inclusive of all the potential electrical equipment installations. Large equipment has special requirements. For the purposes of these requirements, large equipment is defined as equipment rated 1200 amperes or more and over 6 feet wide that contains overcurrent devices, switching devices, or control devices. For this equipment, at least one entrance to and egress from the required working space is required at each end of the working space, and each entrance must be at least 24 inches wide and 6.5 feet high. There are two exceptions to the requirement for multiple entrance/egress points. The first is when there is a continuous and unobstructed path of egress; in that case a single entrance is permitted. For example, if the equipment is on the wall directly opposite an entrance door and there is nothing between the two, this may be permitted as the single entrance. The second exception is when there is extra working space. (Figure 3). 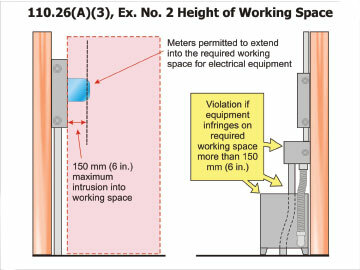 If the depth of working space is twice that required by 110.26(A)(1), a single entrance is permitted. 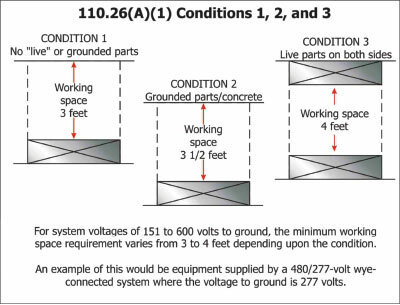 The distance to the nearest edge of the entrance from the equipment must be not less than the minimum clear distance as specified in Table 110.26(A)(1), based on the voltage and condition present. The idea behind this exception is to allow enough space for the electrician to get far enough away from the equipment to avoid being trapped if there is a problem in the equipment between the electrician and the exit. Personnel doors also have special requirements for installations with equipment rated 1200 amperes or more that contains overcurrent devices, switching devices, or control devices. If the door is intended for entrance to and egress from the working space and the door is less than 25 feet from the nearest edge of the working space, then the door has to open in the direction of egress. It must also have panic bars, pressure plates, or other devices that are normally latched but open under simple pressure. (Photo 3). Illumination is obviously important for anyone working on electrical equipment. The NEC requires that illumination be provided for all working spaces around service equipment, switchboards, panelboards, or motor control centers installed indoors. New for the 2011 NECis the specific requirement that this required illumination shall not be controlled by automatic means only. (Figure 4). 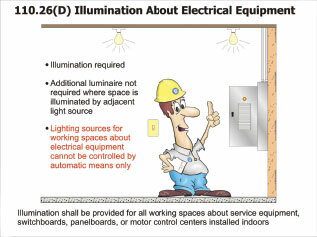 If the working space is illuminated by an adjacent light source or as permitted by 210.70(A)(1), Exception No. 1 for switched receptacles, then additional lighting outlets are not required. Switchboards, panelboards, and motor control centers must be located in dedicated spaces and protected from damage. The only exception to this rule is for control equipment that for some reason (either because of its use or other code rules) must be adjacent to or within sight of its operating machinery. There are separate code requirements for indoor and outdoor dedicated equipment space. Indoor installations must comply with four conditions including rules for dedicated electrical space, foreign systems, sprinkler protection, and suspended ceilings. The dedicated space requirement states that an area equal to the width and depth of the equipment and extending from the floor to a height of 6 feet above the equipment or to the structural ceiling (whichever is lower) must be dedicated to the electrical installation. This prohibits piping, ductwork, leak protection apparatus, and any other equipment that is not associated with the electrical equipment from being located in this space. 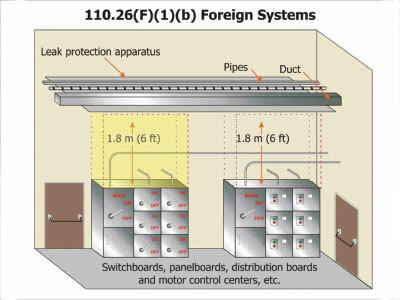 Some foreign systems are allowed above the dedicated space, but only if protection is provided to prevent damage to the electrical equipment from condensation, leaks, or breaks in the foreign system. (Figure 5). Sprinkler protection is permitted for the dedicated space, as long as the piping does not enter the required dedicated electrical space and is protected against leaking. Dropped, suspended, or similar ceilings that do not add strength to the building are not considered structural ceilings. Suspended ceilings with removable panels are permitted within the dedicated electrical space. Electrical equipment installed outdoors must be installed in suitable enclosures and protected from accidental contact by unauthorized personnel, vehicular traffic, and accidental spillage or leakage from piping systems. All of the working space requirements in 110.26(A) still apply, and there is a further requirement that no architectural parts or equipment are allowed to be located in the working space. 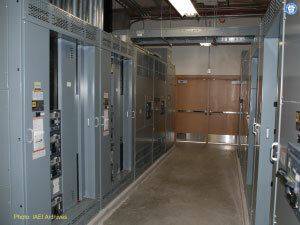 The last section of 110.26 deals with locked electrical equipment rooms or enclosures. If an electrical equipment or room is locked, it is considered accessible to qualified persons. The definition of accessible(as applied to equipment) in Article 100 is “admitting close approach; not guarded by locked doors, elevation, or other effective means.” The language in 110.26(F) is a way to reconcile the requirement of 110.26 that access is to be provided to electrical equipment, while also allowing for locked rooms to protect equipment from unqualified persons. There are additional requirements for equipment above 600 volts, including 110.32, 110.33 and 110.34. Many of the base requirements are very similar to those for equipment operating at 600 volts or less, and I encourage you to read those sections if you design, install or inspect equipment rated at higher than 600 volts. 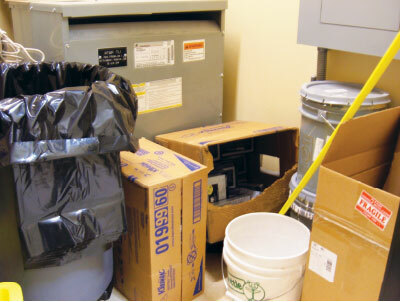 It can seem difficult to find adequate space for electrical equipment due to construction limitations in new buildings or existing buildings; however, the working space requirements are necessary for the safety of maintenance personnel and service electricians. While it is always recommended to de-energize equipment before working on it, there are certain operations (especially testing) that require accessing live parts. The working space requirements provide adequate space for working safely on the equipment and for egress away from the equipment in the case of an abnormal condition.